Take a tour of the James E. Merrill House Museum as it is decorated for the holidays! The 19th century Queen Anne – Eastlake Victorian home is furnished as the Merrill’s and other middle class Jacksonville families lived in 1903. The house exemplifies the Queen Ann style of architecture with a square tower on the southwest corner and an elaborate Merrill House 1900vergeboard in the north gable. The porch posts, brackets, and spindles reflect the Eastlake style. The Merrill residence is the largest and most architecturally interesting of the nineteenth-century houses remaining in East Jacksonville. James E. Merrill started a small iron work business in Jacksonville in about 1875. Known as the Merrill-Stevens Engineering Co. by the late 1880s, the iron work became one of the largest shipbuilding companies in the South. Victorian era lifestyle is showcased in this elaborately decorated family home that also highlights a lifestyle of limited electricity and plumbing. 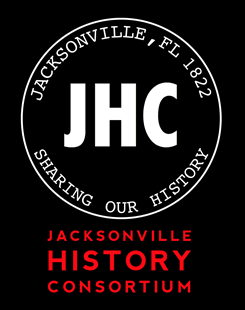 The Merrill House was saved from demolition in 2000 by the Jacksonville Historical Society and City of Jacksonville. The tour should last any where from 45 minutes to 1 hour, depending on the group. If you would like to schedule a group tour, you may contact our office. During the Gingerbread Extravaganza our return contact time may vary. * JHS’s free parking lot is behind the church, and there’s also ample street parking. * Admission to the Holiday Merrill House Museum is included in the Gingerbread Extravaganza admission during running tour hours. For more information regarding this event please see the Gingerbread Extravaganza page.